This cultural route seeks to publicize the profound human, cultural, artistic and scientific relationship between East and West and the way in which the Greco-Roman legacy was passed on to Europe through al-Andalus. 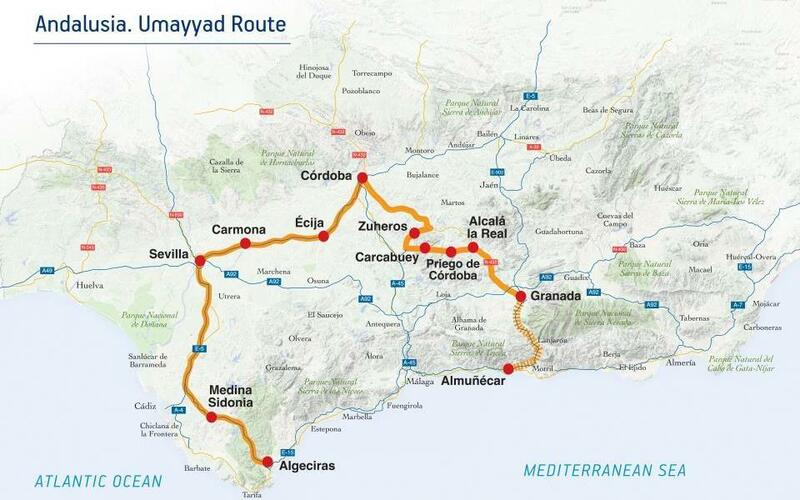 In fact, the proposed route embodies many meaningful aspects of al-Andalus, one of its great milestones being the Umayyad caliphate of Córdoba, a cultural bridge between Europe and the Arab-Islamic world. In the 10th century the Hispano-Andalusian civilization was at its peak. At the crossroads between the Christian, Jewish and Muslim cultures, this cradle of literature, science and the arts was a constant source of invention, mixing the legacies from both sides of the Mediterranean. The Umayyad Route begins in Algeciras (al-Yazirat al-Khadra in Arabic), the gateway through which Islam entered the Iberian Peninsula and where the new conquerors that crossed the Straits of Gibraltar in the year 711 stationed their armies. It was here that Tarik reorganized his troops that same year before taking on the Visigoths. Our next stop is the nice village Medina Sidonia. The city of Seville already had a dynamic cosmopolitan past when it was conquered by the Muslims in the year 712. Isbiliya as it was known in Arabic became one of the most important cities in al-Andalus, of which it was briefly the capital. From here we move on to its neighbour, Carmona, in the heart of the Seville countryside in which Arabic tribes from Yemen settled including the Ibn Khaldun, the family of the great historian of the same name. Our journey continues along the valley of the River Genil where we come to Écija, and thence to Córdoba, the capital of the Umayyad caliphate, its spiritual centre and powerbase, capital of the arts and of wisdom and home to one of the most important buildings in the Islamic West, the Great Mosque, built on the instructions of the overlord of al-Andalus Abderrahman I. In the Province of Cordoba we will be stopping off in three towns that played important strategic and defensive roles: Carcabuey, Priego de Córdoba and Zuheros. From Alcalá la Real, in Jaén, and its impressive Qalat (fort), we will set out on the last stage of the route towards Granada, which had a forerunner in the Emirate and Caliphate periods in the now vanished city of Madinat Ilbira. Lastly, we come to Almuñecar (al-Munakab), where the exiled Umayyad Emir Abderrahmán I, known as al-Dakhil (the Immigrant), first entered the Peninsula.